Personalized Fleece Scarves Custom Embroidered in Bulk or Blank. Promotional, Inexpensive. Budget Prices in the USA and Canada. 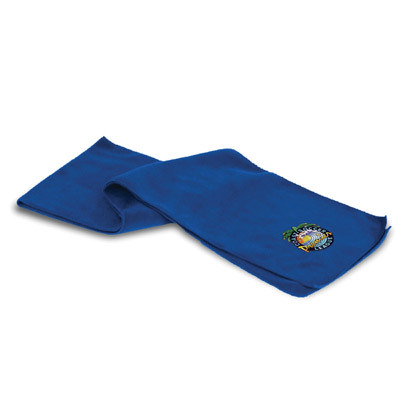 Wholesale advertising Fleece Scarves on sale. Lowest cost in North America. We also supply blank (not personalized) Fleece Scarves: seePrice Table below.. Free Artwork Design. American Clients pay no taxes. The unit prices below include your custom embroidery in up to 5000 stitches. Embroidery Tape: $45.00 per order under 144. Free for orders of 144 and more. Additional Sttches (over 5000): add $0.30 per each 1000 stitches. PRODUCTION TIME: 7-10 working days after art approval. Blank (not embroidered) Fleece Scarves ship next day. Stay toasty with this fleece lined scarf. Made from a polyester and fleece blend, this scarf is guaranteed to keep recipients warm while leaving a good impression with this anti-pill finish. This scarf is a great way to promote your organization or business whether it's at a tradeshow, convention, event, or for daily wear. Embroidered imprinting is available and scarf is only sold in lots of 48. Color: Black, Burgundy, Camel, Charcoal, Cocoa (Brown), Cream, Forest Green, Heather, Navy, Pink, Red, and Royal Blue. Approx. Dimension: 9"w x 60"h Imprint Size: Embroidery *up to 5000 stitches included Embroidery Size: Maximum Embroidery Area: 5"w x 5"h Weight: 260 g/sqm.